Oct 20 Guild Mtg (Note date change) Crayola Challenge! Bring your crayons along with your project. Do you want to join the Yahoo email group for the Guild? If so, please email JoGlass101@gmail.com for an invitation to the yahoo group, which is used only for emails re Guild news and business. Bring your challenge blocks to August 25 meeting. Measurements:Cut a piece of fabric 11 1/2 x 13 and a contrasting fabric strip 2 1/2 x 13. Insert strip anywhere and your block is done. ﻿﻿﻿﻿﻿﻿﻿﻿﻿﻿﻿﻿﻿﻿﻿﻿We are celebrating our 8th birthday at our guild meeting on Monday, August 25th! Of course to celebrate we need food and since quilters have some of the best recipes known to womankind we are asking everyone to bring a dish to pass. Bring a dish you love to make (along with a serving utensil) and a beverage for yourself. From past experience some of these delicious dishes get bragging rites and are talked about the rest of the year. The guild will provide paper plates and silverware. We will plan on eating at 7PM sharp but plan on coming early to renew your membership, help set up tables, look at magazines for sale and to just hang out and visit with each other. Looking forward to seeing everyone to celebrate OUR birthday!!!! ﻿Our Guild members have the opportunity to meet every Thursday for a "Thursday Sewcial" at Mills Chapel Baptist Church from 10:00-2:00. It is a great time to share ideas and socialize while working on projects. Stop in any time and don't forget to bring a lunch. 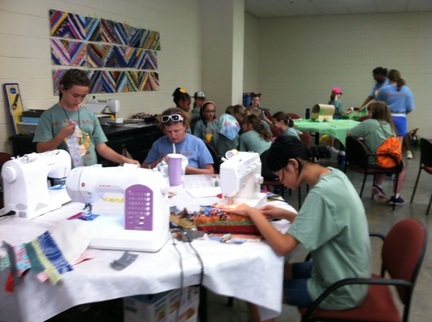 The first Thursday of every month will be dedicated to working on our Compassion quilts. Show and Tell Pictures from the June 22, 2014 meeting. 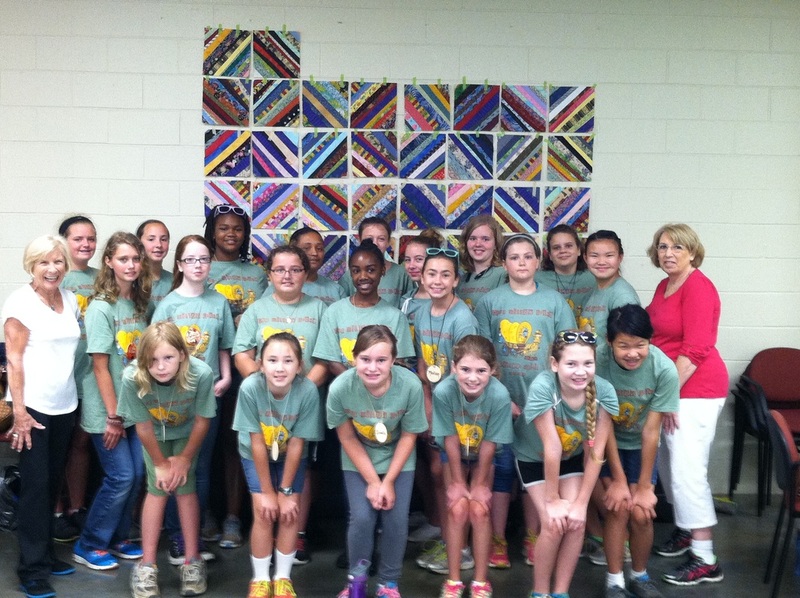 Here are the pictures from the Girl Scout camp. We made 43 squares total with 23 girls representing 5 different troops for the local area. These are Cadet scouts and sewed for 5 days. Joanne Schreptfer worked with me to complete squares. She volunteered her time which I so appreciated. 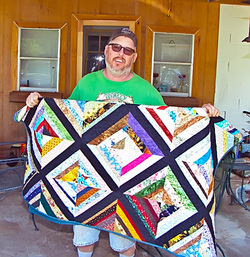 This quilt will be donated to the Veterans at Ft. McPherson. It’s that time of the year again! August begins the new Guild year and your renewal form and money are due. You can turn both in this Monday, Aug. 25, at our Birthday Party. Please print off a form here: Membership Form If you are using a check, please make it payable to Common Threads Quilters Guild for $24. You can add a donation, if you would like, but be sure to let us know what you want it designated for. Pictures from the June 22, 2014 Meeting.